This one had been in the back of my mind for a while. Multi-multi BBG’s in the past had been ridden, but this one had much tougher elements mixed in. Cities. Traffic. Construction. Timing. Variables in weather. Minimal off-bike time for rest. This ride is a lot harder to actually do than it appears on paper. I had been sick with a really bad cold the weekend I had intended to attempt this, so I had to push it back a week, as I didn’t want to risk any added drowsiness. So I wolfed down the antibiotics because the weather window was closing fast to do this ride in the 2017 season. 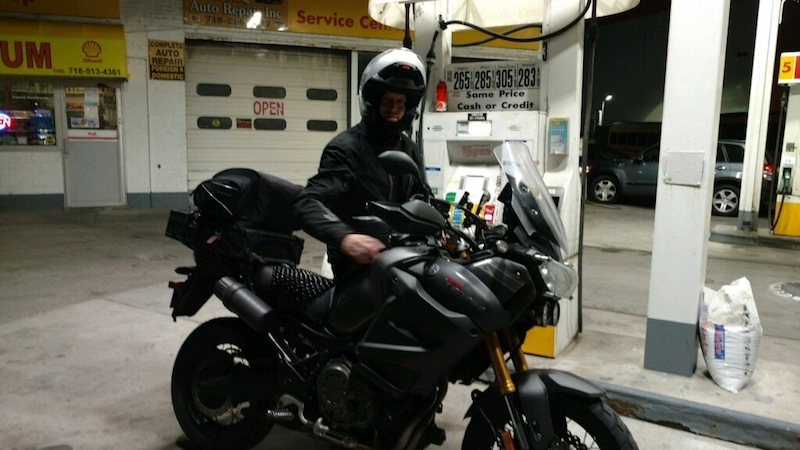 Friday evening prior to departure, I met with experienced riding friends Harry Knerr and Rob Wilensky near my starting hotel just outside of South Plainfield, NJ. This gave easy access in the morning to jump on I-287 and dive into the bowls of Brooklyn where I would start the ride. Hotels in NJ and me really aren’t the most ideal mix. I have no clear answer as to why, but something dreadful always happens. Saturday, the day of the start, I jump in the hotel shower in the morning, turn the water handle on, and it proceeds to fall off, landing on the tub floor. I fumble around for 10 minutes trying like hell to gingerly re-assemble the plastic bits & fit the handle back on into the slotted recess in which it was attached, but no, not happening. Further, the handle decided to make an exit with the water temp at the absolute hottest setting…so brevity in this shower was quickly becoming vital. Unable to shut the water off, I checked out and told the front desk about this problem as I scurry out the door. Saturday must be trash day in Brooklyn, because in the wee hours, all who inhabited the roads were just myself and about 75 garbage trucks. I was stopped at a red light next to one, and the driver of one trash truck and I exchanged friendly nods. I thought to myself this would be the last real contact I would have with another person for several days. But I digress. On larger rides like this, I sometimes print & laminate a sheet with the planned fuel stops and stash it in the map case of my tank bag for easy viewing on the road. I get fuel at 5:00 am at the Shell on Cropsey Avenue in Brooklyn, NY to start the clock, and I scram before traffic gets too bad. I decided to take I-95 the whole way up to where I-80 begins, near the George Washington Bridge, because I thought it would be neat to actually run I-80 literally from end to end, though it would add a bit of time and miles to the ride. I had put all of my heated gear on at the hotel aside from the heated socks, and I was using it for a significant part of this westbound ride to San Francisco. Daytime temps were very comfortable in the mid west, and cooled down after the sun had set as I rode deeper into the night through Nebraska. I took note of Nebraska exit #231 where I had stopped to sleep & turned around the last time I’d attempted this ride because of beginning with far too little sleep (about 45 minutes) leading to truly unimaginable fatigue. Having time well on my side this time, and no real pressure to get to San Francisco by a certain hour, I stopped at the first rest area in Wyoming at Pine Bluffs for a quick 1-hour nap, laying along side of my bike. During my nap, some local yokel jumped out of his pickup, woke me up, and asked me if I had been drinking?!? This was such an odd question for me to comprehend, all I could muster replying was ‘huh’?? My answer probably only led the guy to believe even more I’d fallen asleep drunk. So I jumped on my bike and got the hell out of there before he called the cops. Making good time with the 80-mph WY speed limits, I soon started climbing the rockies at Buford pass just east of Laramie, WY and the temps took a nose dive like always on that pass. The low I saw on the bike was 37 degrees and I had begun wishing I’d put my heated socks on, but I didn’t want to stop again and take the time to put them on. Approaching Laramie and further west, I saw numerous WYDOT highway signs warning of winter weather, such as the one below, and snow the next day, right when I would coming back through. I was not expecting this, as I’d checked the weather forecast repeatedly before leaving, and no precipitation was forecasted. I had my cruise set at about 85 and tried not to worry about the looming snow, but I was. Soon my phone began ringing and some text messages from friends were coming in stating 5-7” of snow was on it’s way right where I was planning to ride leg #2 the next day. I was getting more and more concerned about this. The weather reports were getting worse, and again none of this was even predicted when I’d begun the ride. So it became apparent I’d need a new route back to the east coast if I was to conclude the 100CCC. Several friends gave me route options with varying mileages, which had to be in excess of 2,900 miles, per IBA rules. A number of Florida options were appealing, though not very convenient. 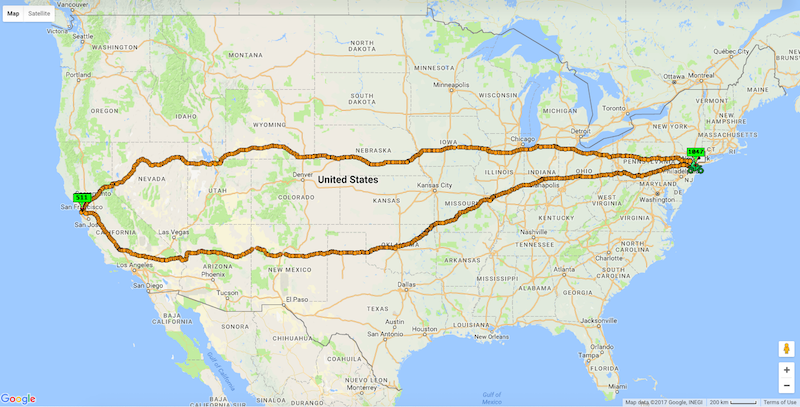 So my good friend Dave Benoit built a route that took me straight back to NYC, via I-5, I-40, I-44, etc. Dave and I discussed this on the phone for about 30 minutes while I was in the vicinity of Sacramento, CA. I decided that was the best option to take, although it added about 180 extra miles. Traffic had gotten really bad around Vacaville, CA, and I was lane splitting on and off for about 5 miles. I finally got into the SF bay area and traffic became more and more heavy the closer I got to San Francisco. I did not expect this to be the case on a Sunday night. I ride over the Oakland Bay Bridge into San Francisco and run I-80 right to its’ western-most terminus at Route 101. From there I find the Shell station on Harrison Street, get fuel and have a girl working inside take my photo. I’d made it the whole way from NY City to San Francisco in 42 hours and 19 minutes, including nap time. Indeed not the fastest, but I wasn't doing this purely for one-way time. I then quickly ride back over the Oakland Bay bridge to my hotel in Emeryville, CA. I told the girl at the check-in counter I’d only be there for a few hours, and asked where I could park. She let me park the bike in their employee parking area (parking is very limited there) which really saved me some time. 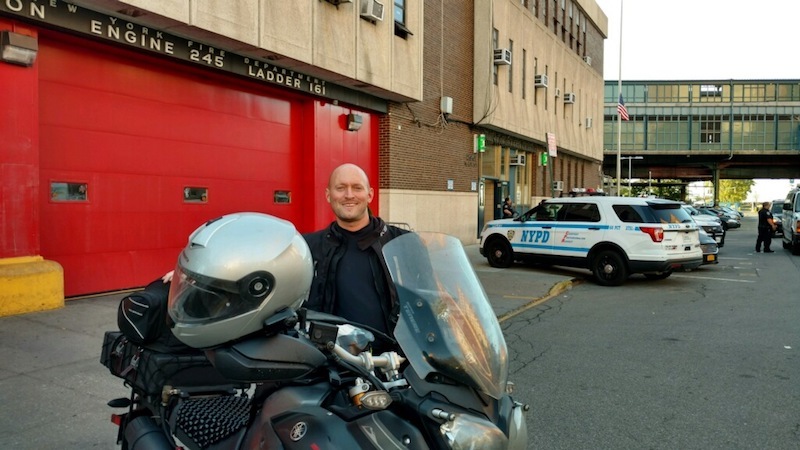 I get into the room, remove my helmet for the first time since I departed New York, review the new route for the ride home briefly on my iPhone, and get to sleep. A great sleep was had in Emeryville, although a bit brief (3 hours). I get a shower and get my mind in shape for the ride home. I cross back over the Oakland Bay bridge, pay the toll (cash) and make the incredibly silly mistake of leaving my gloves under my dash until I’m up to speed before putting them on. In horror I soon see one of my favorite kangaroo-palm gloves has departed the scene. I think for 1 second of leaving it, but I get over to San Francisco, turn around and ride back over the bridge to retrace my route in hopes to locate my glove in the dark of night. Incredibly, I somehow find it where I thought it had taken flight, park the bike, and jog back to pick it up. All in all I chewed up 20 minutes fixing that amateur move I’d made, but I really wanted my glove back. I get back to the same Shell station without delay. I’d noticed the night before that one of my headlight bulbs had burned out, so I take a few minutes and replace both H7’s…(I always carry two spare bulbs). I get fuel and a receipt at 3:02 am Pacific time. At this time of night, there are inhabitants of San Francisco lurking around that are more scary looking than the cookie monster on Sesame Street. So I leave, trying not to make eye contact with anybody, taking one last ride across the Oakland Bay bridge, and see the Golden Gate bridge off to my left. The sunrise was spectacular on Rt 58 passing through the mountains around Tehachapi, CA, not far from Edwards Air Force Base, just north of Los Angeles. I finally reach the beginning point of I-40 in Barstow, and set the cruise for the next several hours. I pass a Los Angeles County Sheriff prison bus and think of the movie movie ‘Fast and Furious’ where this bus is featured. Being Monday morning, I accept several work-related phone calls, all of which I can manage easily without stopping. This western part of I-40 is fast, and knowing the east coast will be much slower, I get across the California desert, Arizona and New Mexico very quickly. I am fighting a very hard crosswind from my right almost this entire time for hours while crossing I-40. Across NM that evening, I’m treated to a spectacular moon-rise with the moon about 7/8 full. Nightfall comes and I am in need of a nap, so I find an exit in north Texas, near Adrian, that is very deserted with no apparent traffic. I stretch out next to the bike and snooze for about an hour on a lovely piece of blacktop that I’ll briefly call home. I fall asleep looking up at the stars. Waking up, I hear cows and semis both in close proximity, and soon launch myself back out into the 80-mph truck traffic on I-40 headed towards the Oklahoma state line. I get over to Oklahoma City and jump on I-44 (the Oklahoma Turnpike) and head towards Joplin, MO. This road is a bit bothersome, because my Prepass does not work on the Oklahoma turnpike, so I have to get out some bills to feed into the bill changer for the coin-only toll collection booths. I stop for fuel in Miami, Oklahoma, which is ironically where I shipped my very first 100’ radio tower about 16 years ago to a mushroom farm. I get into Missouri and elect to take one final power nap. So I hit a rest area, and this time I just sleep on the bike. I am awakened by an attractive woman who thinks absolutely nothing of being quite talkative. She asks about my bike. About my riding gear. About my helmet. About my fuel cell. About my GPS. She asks about damn near everything on my bike. I was half expecting her to ask to sit on it. I didn’t have the heart to tell this woman to bug off, so I talk to her for about 10 minutes until she is satisfied with the answers provided. Turns out she’s a state employee and works at that rest area. In hindsight, I should have just gotten her number and had this discussion about her new found interest in motorcycles at a time in which I was not under such duress of the clock. Working up through St. Louis, I get over to the western edge of Indianapolis where I spot a bike on the side of the road. Somehow I instantly recognize who this is, not by the bike, but rather by the yellow jacket of the rider. It’s my friend Tom Southwood, and he’s sitting there waiting for me to roll past. Tom and I ride until exit 10 in Ohio where we both fuel and chat briefly. Tom turns around and goes home while I head towards Pennsylvania where there is a great deal of night time paving going on, slowing me down some. 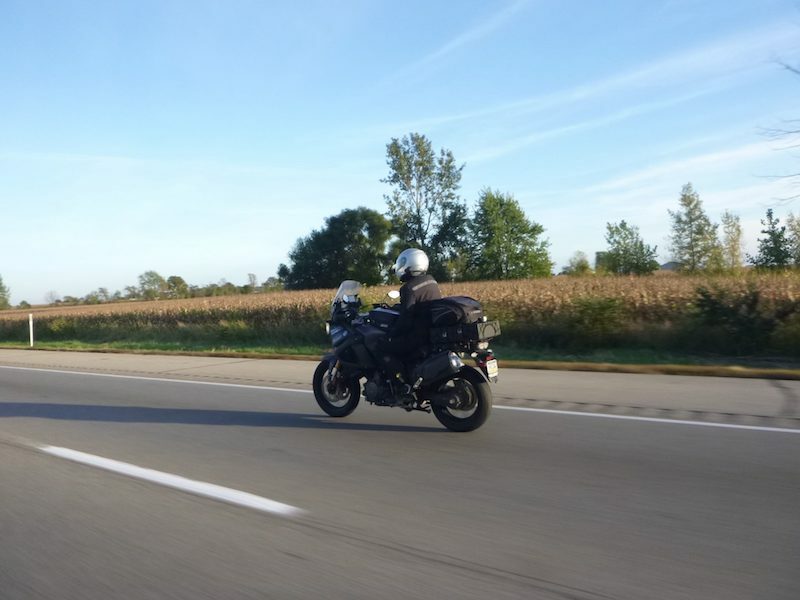 Tom got this photo of me in eastern Indiana on I-70. I’d texted another friend, Joanna Southwood a bit on this ride, and low and behold she was planning on being in New York City during the time of my arrival there. So she immediately offered to meet at the Shell station on Cropsey Avenue and be an ending witness. It was a huge boost having Joanna to actually see at the end. Later on, near Allentown, PA, Harry Knerr and I talked on the phone, and he too was waiting for me at PA Rt. 61 & I-78 at around 3am, where we rode east together for about 40 miles. I approach New York City one final time (hopefully it stays that way) and I somehow manage to get myself utterly lost in Brooklyn, even with a GPS right in front of me. No sweat, there’s ample time to spare. I finally reach the road that I want, find my ending gas station, find Joanna, and my 100CCC is concluded, just as my bike flips 120,000 miles. Joanna and I go to the Coney Island police station for a 2nd witness, where this final photo was taken. By now traffic has really built in Brooklyn, and it’s time to head 5 hours home. Leg #2 was quite a bit longer than Leg #1 in terms of miles and construction, and I rode this last leg in 47 hours and 16 minutes. This 100CCC Insanity Gold (100CCC The Hard Way) is much more challenging than it appears on paper. Even more challenging than the 10-day, 10-BBG Deca ride I also completed. The 100CCC allows for much less sleep, and includes numerous cities, some of which are heavily populated. The entire ride was 6,105 miles and I completed this in 96 hours and 18 minutes. Below is what the total route looked like on Spotwalla.